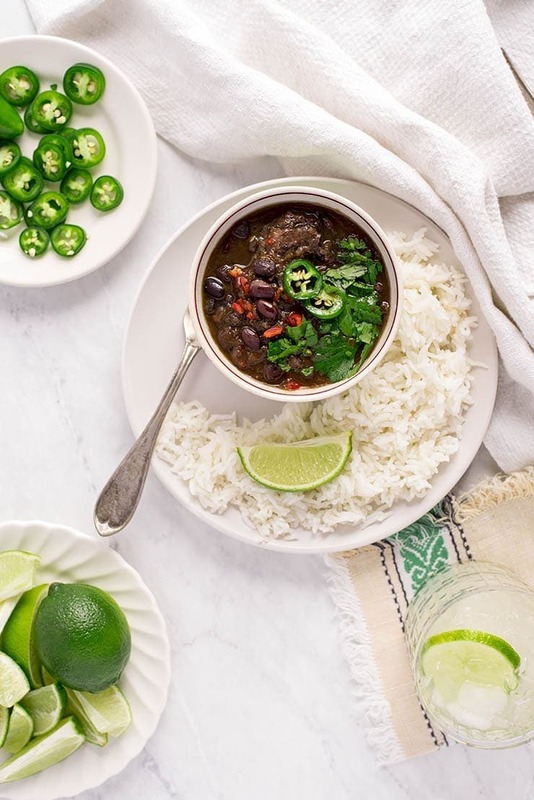 Making these slow cooker black beans from scratch is so easy, and so flavorful, canned beans will be a thing of the past! 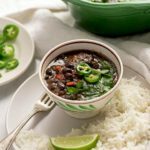 These slow cooker black beans have become one of my favorite recipes which seems crazy to say now. There was a time when I wouldn’t eat beans at all…not in chili, not on tacos and certainly not as a stew on rice. Most of the time, I’ll take the blame for my food preferences and dislikes, but on this account, I blame my mom. When I was just a wee thing, she read to me Mickey and the Beanstalk over and over. Of course, it was Disney’s twisted version of a fairy tale in which everything seems more pleasant but the moral of the story is totally lost. In this version, Donald says “I hate beans” which is the only lesson I appeared to learn from the book. “I hate beans” in turn became a common refrain over the years as I refused to eat beans. Alas, times change! In my 20s I became an adventurous eater. Working in the restaurant industry certainly helped, but so did my love of all things Martha Stewart and the influence of Kevin and his family. Each new recipe and restaurant challenged my dislikes and over the years I’ve come to love many ingredients I never would have eaten in my youth. 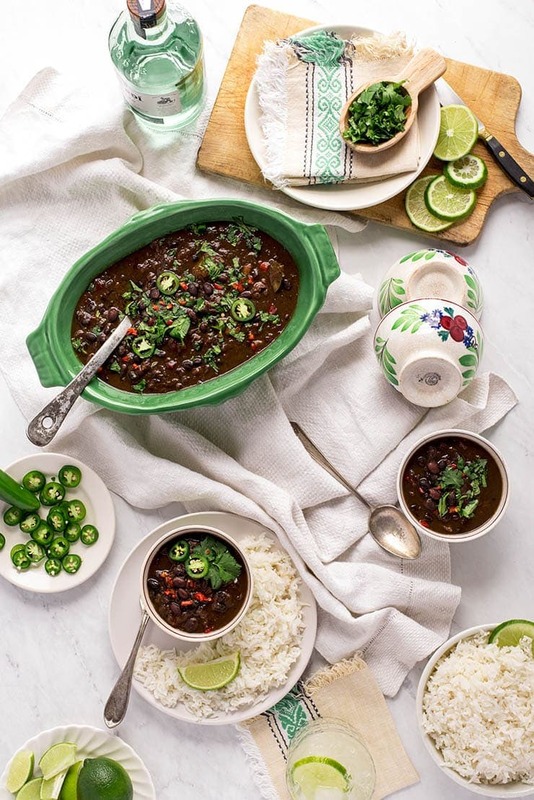 Kevin and I have been making these slow cooker black beans for years now. I’m so sorry I’ve kept this recipe a secret from you because you’re going to love it and wonder why you haven’t been making beans from scratch all along! Just like our chorizo beans recipe, it’s a versatile dish…great as a main course, side dish or topping. Because of this flexibility we eat these black beans all the time! One of the reasons we love it so much is homemade beans are super flavorful. You could say that twice for these beans! However, I really struggled with what to call this recipe because these black beans aren’t really Cuban, Puerto Rican or Mexican but instead fusion. It’s inspired by our trips to Puerto Rico and our favorite Cuban and Mexican restaurants, pulling together my favorite elements from each cuisine and melding them together into one all purpose recipe. I’ve used sweet bell pepper and butternut squash to replace the sugar present in many recipes. It’s a trick I’ve picked up from Puerto Rican cuisine and obviously, it’s much healthier way to make your dishes sweet. This recipe also calls for epazote, an herb from Central America that is commonly used in Mexican cuisine. It’s said to be an antidote to the gassy effect of beans. I add it to my enchilada sauce and just about any Latin American dish that might contain beans because I don’t need to feel bloated. The rest of the ingredients are more like standard Cuban frijoles negros….onions, garlic, bay leaves, jalapeno, cumin, cilantro, vinegar and bacon. All the good stuff! There is a creaminess to these Latin style beans because they are simmered with vegetables that break down in the sauce, thus thickening and flavoring the stew. I mean, it’s hard to go wrong when your beans are swimming in a delicious broth! 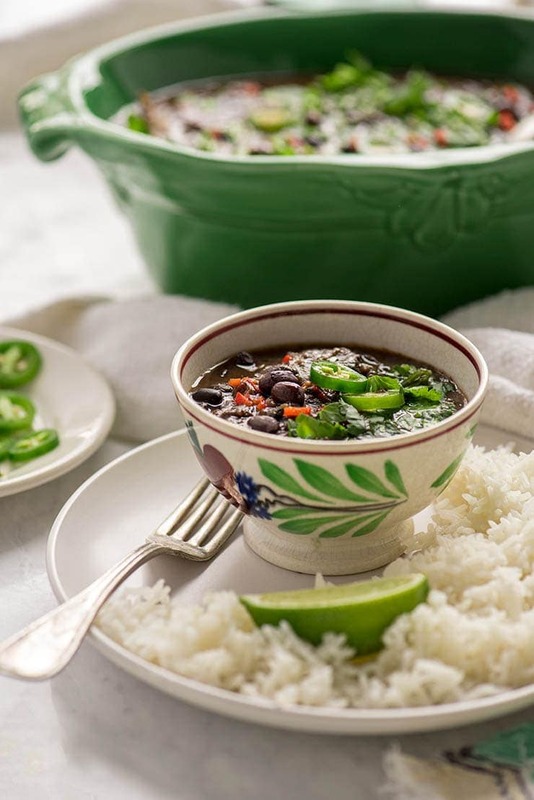 The first day we make these crockpot black beans, we eat it over rice. It’s super satisfying this way and really hits the spot when the weather is chilly. Then we freeze the leftovers to pair with other dinners like our chicken enchiladas or shrimp tacos. But we use these beans in just about any recipe that calls for black beans. You’re going to love the thick, piquant sauce and the tender bite of the beans. And I’m pretty sure you’re going to mad that it took me years to publish the recipe! Do black beans have to be soaked before cooking? The answer is no, but it can speed up the cooking time. Soaking is also said to help with the aforementioned gas. For information on soaking methods, this post from the Bean Institute is helpful. Are black beans good for you? YES! Not only are they rich in folate and a great source of plant based protein, beans can help lower bad LDL cholesterol. Pulses (beans, peas, lentils) have many health benefits. Check out this article from Foodal for a more info! Can I make this recipe in the oven? YES! My mom helped me prep this recipe, so I sent her home with the ingredients to make her own beans. She cooked them in a Dutch oven at 300F for about 5 hours. How long will it take to cook the beans? No clear cut answer here unfortunately. It depends on how large the beans are, if you’ve soaked them and the temperature of your crock pot or oven. I always leave extra time because beans can be unpredictable. They can be left on warm in the oven or crockpot if they get done early. They are also great leftover, so you can easily reheat them if you’d like to make them a day or two in advance. Make sure to transfer them directly from crockpot to refrigerator for food safety. Can these black beans be made without bacon? YES! Use 2-3 tablespoons of olive oil to replace the fat from the bacon. You might need to add more salt at the end though. 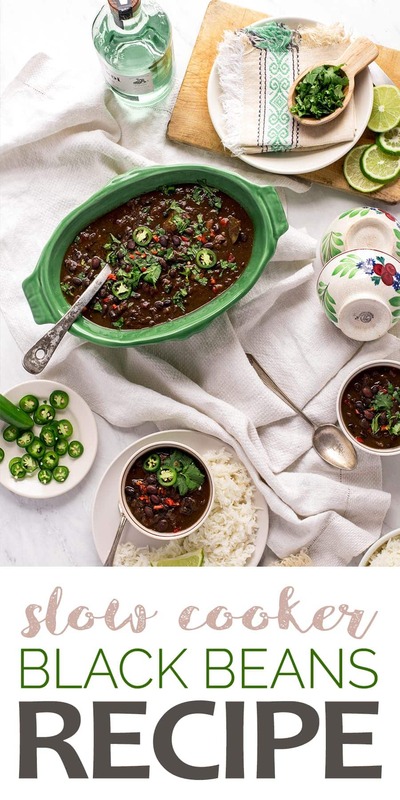 This black bean recipe is an amalgamation of some of my favorite Latin American techniques and ingredients. If you love Cuban black beans, you'll find this recipe similar but a little sweeter thanks to the squash. Whether you're eating Mexican, Cuban or Puerto Rican fare, this is a perfect complement to the menu. Sift through black beans and pull out any stones, then rinse. If desired, place in a large bowl, cover with water and soak overnight in the refrigerator. This will speed up the cooking time a little, but is not necessary. On the stove in a large skillet, cook diced bacon over medium heat to render the fat. When the bacon is mostly cooked, add onions and garlic and saute until onions are golden. While the onions are cooking, finely chop the cilantro stems saving the tops for garnish. Transfer bacon onion mixture to a large crockpot and add the cilantro stems and the rest of the ingredients. Cook on low for 7-9 hours or until the beans are soft and the vegetables have turned into a thick broth. Serve with chopped cilantro leaves. If you decided to soak the beans, it's safest to do so in the refrigerator to prevent fermentation. Always drain and rinse soaked beans. For a vegan or vegetarian version, skip the bacon and use 2-3 tablespoons of olive oil to saute the onions and garlic. Sauteing the onions is optional, however we highly recommend cooking the onions first. Without this extra cook time, the onions can add a bitter quality to the beans. You can prep the bacon, onions and garlic in advance and refrigerate them until ready to cook. In fact, this dish is easy to prep the night in advance and then put into the crockpot in the morning. This recipe freezes really well. We place the beans in small, medium and large jars so we have the perfect amount to add to tacos, burrito bowls or to have as a quick meal with rice. This main course dish is naturally sweet, flavorful and ultra creamy! 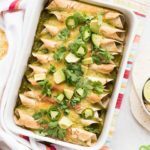 You’re going to love the chicken and sweet potato filling that’s rolled up and topped with homemade poblano sour cream sauce!!!! 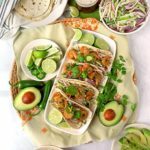 Brighten up your dinner routine with these easy, 30-minute Tequila Shrimp Tacos! 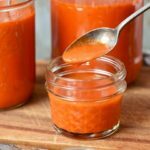 Get the joy of delicious, roasted red pepper enchilada sauce in less time. Our recipe is a snap to make but you’d never know it from the gourmet taste! I’ve never made black beans like this but I want to! I love slow cooker recipes and I’m always looking for new recipes to try for my daughter. Thanks for the inspiration! You’re welcome Dominique. Your daughter is so lucky to have a mom that makes her homemade food! Black Beans were always on my black list but this dish looks delicious. 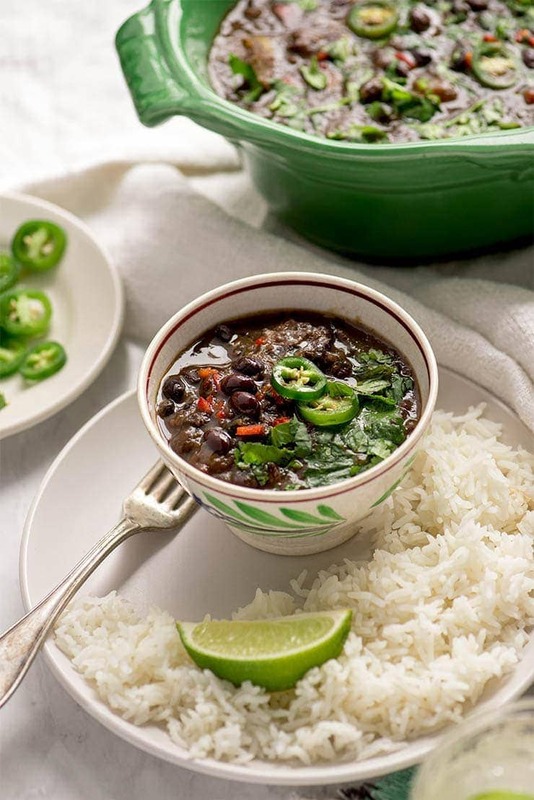 Love the ingredients and flavors used to making these black bean recipe so amazing. Love all your ideas to using this recipe too. Meaning you haven’t liked black beans? I think beans are only as good as what they are cooked in. Straight out of a can they are only good as an ingredient in a flavorful dish. To eat them on their own you have to make them with yummy ingredients or they are boring. Hope you give them a try Veena! The slow cooker is perfect for beans, and I love all of the flavours in this dish. I’m craving beans just looking at it, so I’m excited to try it! The slow cooker is the easiest way to do slow food for sure! A great way to save room on the stove when serving a large group. What a delicious side to enjoy on Taco Tuesday! Absolutely! Crock pots are a miracle worker for parties! Oh wow this looks so good! What a flavorful and hearty dish. Perfect side to so many warm-weather dishes coming but, I also wouldn’t mind this on its own! Yes! Great for Cinco de Mayo and Memorial Day but so good on it’s own too! Personally, it takes me a week to build a burrito bowl from scratch, so the first night we always eat the beans over rice. It’s a very humble and satisfying meal. This looks like my kind of dish. Easy, satisfying and perfect for when I want a comforting meal without a lot of fuss. It really is a set it and forget it type of recipe. Oh my gosh I haven’t made black beans and rice in forever! I’m so craving this right now and I’ll be pulling out the slow cooker this week! Hope you love it Anne! You’re welcome Karyl! Dutch ovens are a gift that keeps giving! Ours is so well loved! Thank you so much for this recipe! 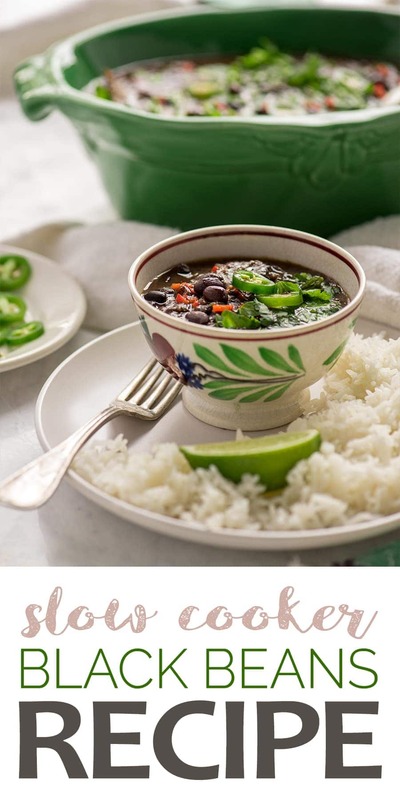 I absolutely love black beans and your recipe will definitely hit the spot! Wow, look at those beans! These would make the perfect weeknight dinner. Getting my slow cooker out to try this sometime this week! Hope you love them Sam! These sound delicious and I love that they make use of a slow cooker! 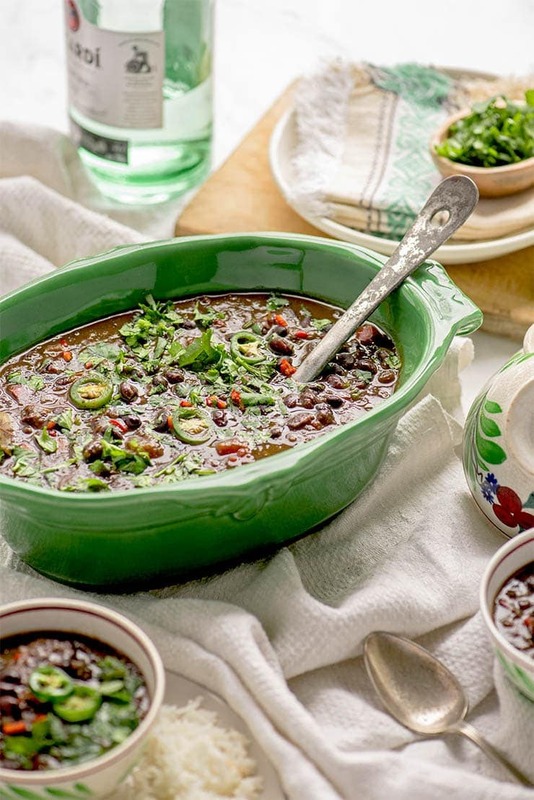 Talk about the perfect way to make delicious, no-fuss black beans! Slow cookers are the best! This looks really flavorful and delicious. Plus it’s super easy to make. It’s perfect weekend family dinner. I’m saving this recipe to give it a try next weekend when my hubby get back home from trip. He is such a fan of black beans. Well I am too. Hope your husband loves the beans! Oh my goodness, these beans look incredible. Perfect for a CINCO de MAYO spread of delicious food! I’d also like to quickly mention that you styled this recipe beautifully. These photos are so beautiful! Thanks for your kind words Krista! I really love the art of food photography. It’s all about telling the story of a recipe. Your photos are gorgeous! This sounds delicious! And definitely seems like it would be perfect for a cold day. We use a decent amount of canned black beans, I think these would be way more flavorful! Thanks Melissa! So perfect for a cold day. We’re expecting another snow storm while my husband will be away on business, so I’ll be pulling the leftovers out of the freezer for an easy, comforting meal.